Hydro Mask has a soothing and calming action on the skin that immediately reduces the appearance of skin redness and irritation. Hydro Mask contains intensive moisturising properties that replenish sun damaged and dehydrated skin. Hydro Mask contains powerful antioxidant ingredients and helps to smooth and soften the appearance of fine lines and wrinkles. 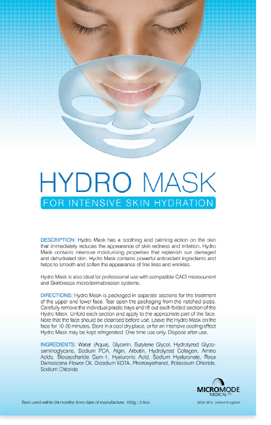 Hydro Mask is packaged in separate sections for the treatment of the upper and lower face. Tear open the packaging from the notched sides. Carefully remove the individual plastic trays and lift out each folded section of the Hydro Mask. Unfold each section and apply to the appropriate part of the face. Note that the face should be cleansed before use. Leave the Hydro Mask on the face for 10-20 minutes. Store in a cool dry place, or for an intensive cooling effect Hydro Mask may be kept refrigerated. One time use only. Dispose after use. Water (Aqua), Glycerin, Butylene Glycol, Hydrolyzed Glycosaminoglycans, Sodium PCA, Algin, Arbutin, Hydrolyzed Collagen, Amino Acids, Biosaccharide Gum-1, Hyaluronic Acid, Sodium Hyaluronate, Rosa Damascena Flower Oil, Disodium EDTA, Phenoxyethanol, Potassium Chloride, Sodium Chloride.